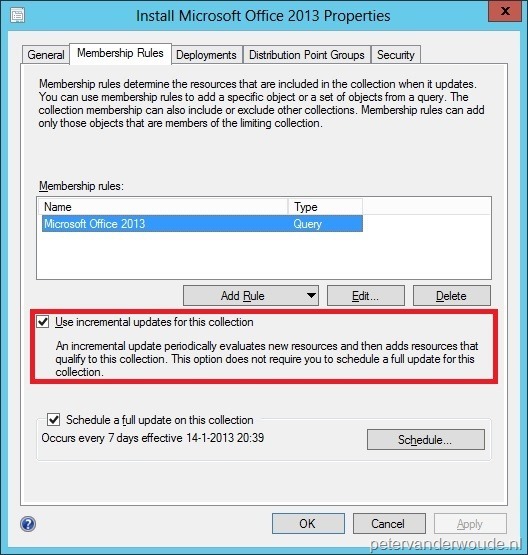 This week my post will be about catching Active Directory Group Membership changes. I choose this subject, because I still see and get questions about how long does it take before a group membership change is active in a collection. The short answer would be, based on default settings, between 1 till 10 minutes. In the rest of this post I will show a longer answer on why it’s like that. The main reasons are that the Delta Discovery and the Incremental Updates are working now. First thing is to enable delta discovery. To configure the delta discovery navigate to Administration > Overview > Hierarchy Configuration > Discovery Methods. 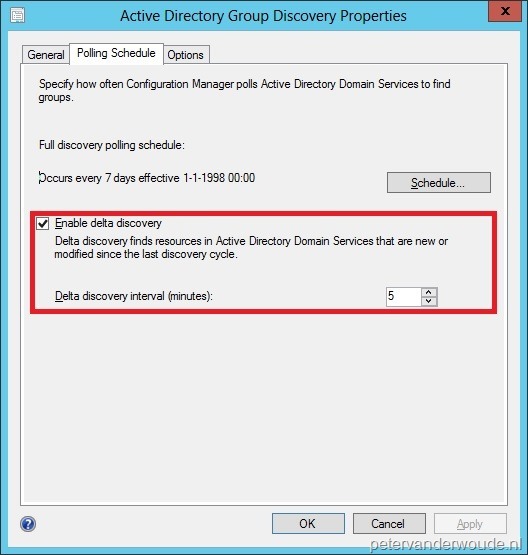 Now double-click Active Directory Group Discovery to open the Active Directory Grou Discovery Properties and go to the Polling Shedule –tab. Select Enable delta discovery and leave the Delta discovery interval (minutes) default. Note: Delta discovery does NOT work for deleted objects from the Active Directory. select SMS_R_USER.ResourceID,SMS_R_USER.ResourceType,SMS_R_USER.Name,SMS_R_USER.UniqueUserName,SMS_R_USER.WindowsNTDomain from SMS_R_User where SMS_R_User.UserGroupName = "PETERTEST\\Microsoft Office 2013"
Note: To change the interval for incremental updates take a look at this post. As my log files show, this whole process took less then a minute. So when a user is added right before the delta discovery starts it can be within a minute that the user is part of the collection. In the most extreme situation when a user is added right after the delta discovery had run and then, when the delta discovery finally runs again, it runs so long that the incremental collection update didn’t pick up the change yet, it takes up two full cycles of, in this sample, 5 minutes. So, also the long answer is between 1 till 10 minutes. The recommended max for the number of collections with incremental updates turned on is 200. How do recommend doing this when you have significantly more than 200 collections? It’s a recommendation that also depends on the sizing and performance of the environment. The most important thing is that you’ve got to carefully plan your collections. You have to keep in mind that not every collection needs incremental updates and that, for example, changes with a full collection update will trigger an update on related collections. That’s correct, it’s all about performance and sizing. Especially in larger environments it can be challenging to find the correct balance in collection evaluations. Also, beware with manually triggering collection evaluations, as it can trigger a chain of evaluations. Like I mentioned earlier, it’s all about planning.